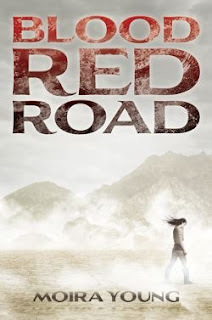 Blood Red Road by Moira Kelly. Just look at that cover. The mountains, dust clouds, Saba walking off. From the cover alone I would pick this up. We knew about this title but yesterday we were able to read the first 30 pages online and were hooked. All we can is this book is unique, different in style, and Saba, like our favorite heroine Katniss, is a strong protagonist. Check it out for yourselves at Simon & Schuster's Blood Red Road page. This book has already been optioned by famed director Ridley Scott! Summary: Saba has spent her whole life in Silverlake, a dried-up wasteland ravaged by constant sandstorms. The Wrecker civilization has long been destroyed, leaving only landfills for Saba and her family to scavenge from. That's fine by her, as long as her beloved twin brother Lugh is around. But when a monster sandstorm arrives, along with four cloaked horsemen, Saba's world is shattered. Lugh is captured, and Saba embarks on an epic quest to get him back. Blood Red Road, hardcover, 448 pages, will be published on June 7 by Margaret K. McElderry Books. It really does have an awesome cover and an awesome summary! Love that cover!! Sounds like a good book.